Blue passes ball to A, then closes him down and tries to prevent him scoring - if x wins ball he then attempts to dribble across a start line. 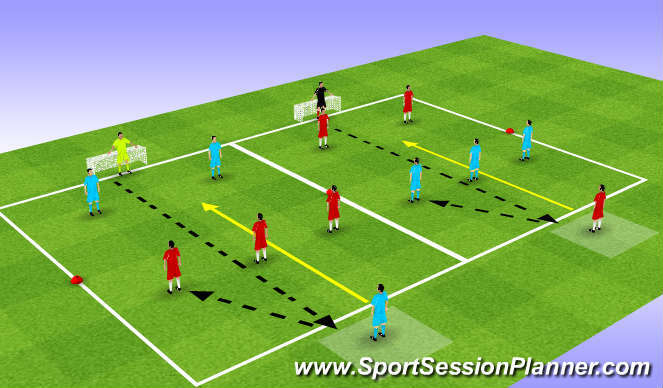 2 Pitches playing at same time - reds attack 1 goal defend the other reds also GK starts play by throwing ball to defender in box - he passes to one of three attackers once they pass red discs defender can make recovery. *defenders need to delay as long as poss. *they may need to lightly pressure ball without committing themselves. *recovering defender runs towards goal untill he gets goalside. Travel quickly as ball travels, arms length, low, Side on. Jockey, send player away from goal or weaker foot. Nearest man closes ball. 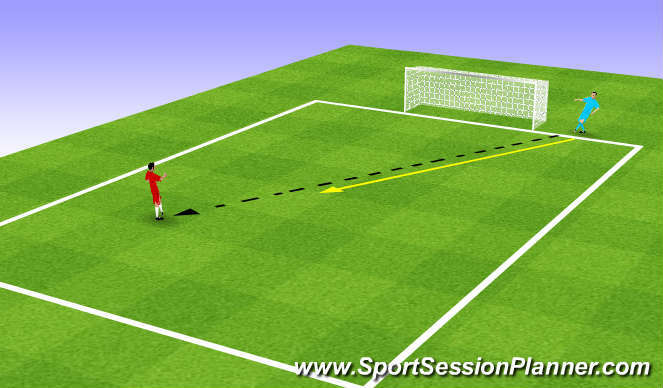 2nd man - position where he can see ball and 2nd attacker also where he can cover 1st defender. Match tempo lots of sprints and changes of direction/ change defenders regularly. Defenders need to comunicate - pass plaers on, dont have one defender doing all the work. All players performed session confidently, big improvement with quality of defending as session progressed.